Should you have a loan-out company for your work in entertainment? I'm frequently called upon by clients to form a so-called “Loan-Out company” for them. Just as frequently, they don't really understand the purpose of Loan-Out, how it will operate, or even whether it's actually a good idea, given their circumstances. What follows is a brief explanation. But as always, it's important to consult with your tax and legal advisers before embarking on any legal strategy for your career or business. 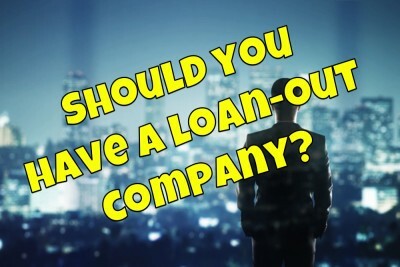 What is a Loan-Out company? A loan-out company is a legal business entity established for the purpose of providing the personal services of its owner/employee to third parties. Loan-out companies can take many different forms such as LLC, an S-Corporation or a C-Corporation. The loan-out company “lends” it's employee's services by making contracts with the end-users of those services… often producers, production companies, record labels, etc. Asset Protection. Because the company is a separate legal entity, it's property is not available to repay creditors of its owners, say, in the case of liability arising from things such as car accidents or breaches of contracts made outside the loan-out's purview. Fiscal Year Tax Planning. By selecting a fiscal year, the company can sometimes realize a major first-year tax savings. A carefully considered fiscal year strategy can also help stabilize the distribution of income and expenses. Lower Corporate Tax Rates. While individuals pay taxes on a tiered, or progressive basis, with tax rates increasing to higher percentages for higher earners, corporations are taxed at a flat rate which is often lower than the rate for an individual earning the same gross income. Qualified Pension and Profit Sharing plans. A properly organized company has a number of deductions available to it that individuals are not permitted to take on their personal tax returns. So, loan-out companies are useful in retirement planning. Also, since many entertainment ventures don't result in income for several years following the performance of services, profit-sharing plans can be used to stabilize finances. Medical Reimbursement and other employee benefit plans. Individuals who pay for their own health plans cannot realize the same deductions and savings as companies paying for employee benefits. Aloan-out company can deduct the costs of reimbursing employees for medical expenses under a properly constructed medical reimbursement plan. Is a Loan-Out company right for me? For most successful industry folks, a Loan-Out is worth considering. the primary factor in this, of course, is income. My discussions with accountants and other tax advisers suggest that if you are earning less than $75,000 annually, a loan-out company probably isn't worthwhile. But will probably be worthwhile if your earnings are between $75,000 and $100,000, and for earnings above $100,000, the benefits are almost a certainty. Annual operating expenses. A loan-out company has to maintain its status by making annual filings and tax payments to the state in which it is formed, and possibly to other states where it conducts operations. (for example, a Delaware corporation whose owner is an actor with homes in New York and California, where she renders substantially all of her services will be required to “qualify” in those states as well)(It should be noted that an individual in the same circumstance would likely still be responsible for taxes in each state where substantial earnings occur). Double taxation. First, the Company must pay taxes on its net earnings, and then, the employee/owner pays taxes on whatever wages and bonuses the company has paid it. IRS may reallocate income. If the IRS deems it necessary to prevent tax avoidance, it has the authority to reallocate income to taxpayers sharing common ownership and control. Thus, the owner of a company may be taxed at the higher personal rate if things are not handled correctly. Mostly, this occurs when the company is formed after the signing of the contracts for the artist's services. Thus, it is important that the company be established in advance, whenever possible. Or, contracts should be renegotiated once the company exists. A Loan Out Corporation if for the services of an individual per a contract may be categorized by IRS as a “Personal Holding Company” and as such, it will pay a much higher tax rate than other corporations on any income left in the corporation at year end. An individual's corporation is required to pay the matching FICA / Medicare Taxes that the employer pays on a individual. For a salary of $100,000, it will cost and extra $7,650. that individuals don't pay. This cost along with the additional costs of paying a bookkeeper and accountant to prepare quarterly payroll tax returns and Corporate tax returns could end up costing more than any tax savings by writing off expenses. It doesn't really pay for an individual who makes less than $200,000. Then there is also the 1099 requirements and potential penalties. The individual must make sure that he is covered for Worker's Compensation insurance by the production company even though he or she is using a “Loan Out Corporation” or he will have zero medical coverage if he is hurt on a set. SAG Medical Insurance may not cover. How do I get a Loan-Out? Forming a loan-out company isn't materially different from forming any corporation or limited liability company. After an initial filing with the state government, the company must prepare its operating documents (Bylaws, Operating Agreement, Minutes, etc. ), issue shares or interests, obtain a Tax ID number, and comply with other state filing requirements. In addition to the above “normal” entity formation tasks, the company must enter into a properly constructed employment agreement with its principal. From this point on, prospective employers will hire not the individual, but the company, which will “lend” the individual's services to the hiring party. In most instances, the hiring party will require that the individual also enter into an “inducement” agreement, essentially guaranteeing performance and disclaiming any separate rights or claims against the employer. What does it cost to create a Loan-Out? The cost of forming a loan-out corporation will vary from state to state, depending mostly upon the particular state's filing fees. In California, the cost of forming an entity are rougly $200 plus attorney's fees. This cost covers filing fees, messengers and copying, and similar incidental expenses. Additionally, there may be initial-year minimum state taxes ($800 in California), and other small filing fees due within a few months after the company is established. Is there a Loan-Out company in your future? Successful people in the entertainment industry often furnish their personal services through loan-out companies. The effective use of a properly structured loan-out can provide substantial tax and other benefits, but without proper planning and administration, tax and business problems can outweigh the potential advantages. So, it's obviously important to consult with your tax advisor and an experienced entertainment lawyer. Sign up here for a free consultation to explore this or any other entertainment law matter you may be struggling with. ← Asked and Answered: Can I get old podcast episodes taken down if I no longer want to be associated with the show I co-hosted?